In 1762, the Earl of Sandwich asked for his meal to be served between two slices of bread, and since then his invention--the sandwich--has spread all over the world. That tradition was mixed with the flavor of American ingenuity by two men: J.L. Kraft brought his cheese products to market in 1915, and Otto Rohwedder invented the bread slicer in 1928. Thanks to them, the grilled cheese sandwich earned its unique place in our family kitchens. At Capitol Melts, we take the simple idea of a grilled cheese and elevate it for the twenty-first century. Our sandwich mixtures use the freshest cheeses from only the finest cheese makers in New York and New England because for us, quality can only mean supporting the local farm community. Combined on-site with superior flavors, we make every sandwich fresh to order so our customers have the best experience possible. 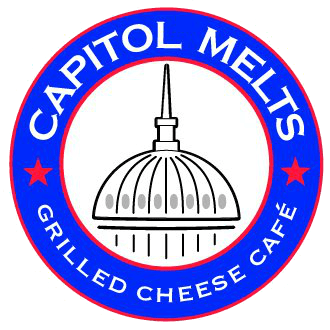 Capitol Melts is open every weekday for breakfast and lunch--stop in to try one today! Our ingredients are freshly sourced, helping sustain our local community and bringing your food directly form farm to table. We take the time to get to know our clients, ensuring quality support to fit exactly what you need. "Capitol Melts is a nice contemporary style grilled cheesery. I had the roasted red pepper and spinach grilled cheese which was amazing. Service was very quick and pleasant staff." "Great food, great coffee, great people, convenient location!" Ask for jalapeño if you like it hot like me (kinda like In-N-Out's secret menu) Great food, great location and nice people.